Former Cardiff Devils captain Ryan Finnerty. 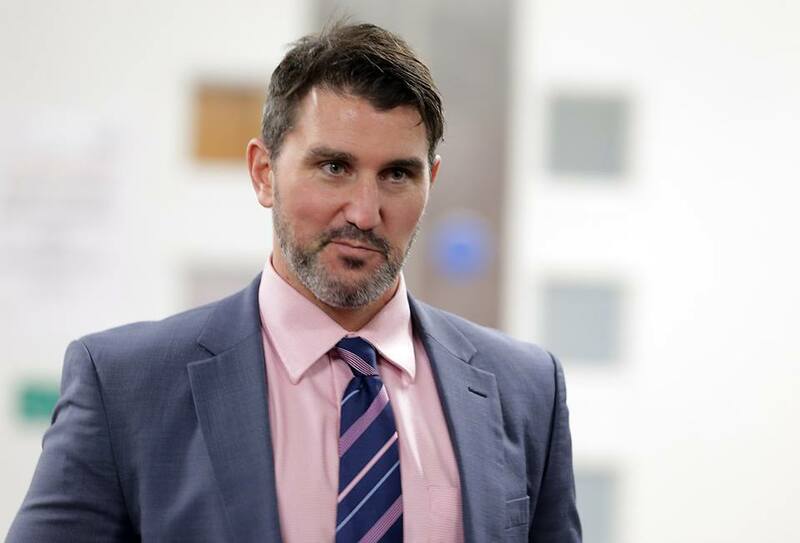 is Manchester Storm coach Pic: George Monaghan. Former Cardiff Devils captain Ryan Finnerty and his Manchester Stormtroopers play a massive role in the Elite League title chase over the next 48 hours. Head coach Finnerty’s Storm play second-placed Belfast Giants at home this evening (Friday) before travelling to face Devils at the Viola Arena in Cardiff Bay on Saturday. Cardiff are four points ahead at the top with four fixtures to play, although Giants do have a game in hand. Canadian forward Ferland, who played NHL hockey for Montreal Canadiens, believes Giants will thrive on the title chase pressure, saying: “We have what it takes. We’ve been proving it all season long by coming so close in the Continental Cup and winning the Challenge Cup again. “We have the team to succeed. “The League title is the big championship. Last season we didn’t have a chance at winning it, but we’re in the race and it’s fun to be a part of it. “It’s exciting, good pressure. It’s why you play hockey. Ferland, a 36-year-old forward, was on the bench acting as assistant coach when Jordan Smotherman’s overtime winner ensured that Belfast retained the Challenge Cup in Cardiff. As a coach, the Quebec native is relied upon as somebody who has won Championships before – a Calder Cup with Hamilton Bulldogs and the EBEL title with Vienna Capitals. Ferland, though, is likely to play against Storm with David Rutherford nursing an upper body injury, while Stephen Murphy should retain his place between the pipes as Tyler Beskorowany remains out. Storm will be fired up for their matches against Giants this evening and Devils tomorrow, having dropped out of the play-off places in midweek after Coventry’s win in Dundee. Finnerty’s have earned four successive home wins at their Altrincham home area and have beaten both Belfast and Cardiff there this season. Giants have picked up only three wins from their last eight away games away. Guildford Flames travel to play MK Lightning, who have withdrawn from Elite League hockey from next season, this evening (Friday). There are less than 25 tickets remaining for Cardiff Devils home clash with Manchester Storm at the Viol on Saturday. Telephone 0800 0842 666 or call in person at Viola Arena for ticket information. Stephen Dixon and Charles Linglet celebrate a Cardiff Devils goal. Saturday 23: Cardiff Devils v Manchester Storm (7pm), Glasgow Clan v Nottingham Panthers (7pm), Sheffield Steelers v Milton Keynes Lightning (7pm), Fife Flyers v Guildford Flames (7.15pm). Sunday 24: Belfast Giants v Sheffield Steelers (4pm), Dundee Stars v Cardiff Devils (5pm), Guildford Flames v Coventry Blaze (6pm), Fife Flyers v Nottingham Panthers (6.30pm). Wednesday 27: Coventry Blaze v Belfast Giants (7.30pm).